Our specialty is large scale qualitative polling using the Internet. This is "qual you can count on" because unlike normal qualitative polling the samples are large enough to apply some quantitative analysis techiques. Normally qualitative research is conducted via small groups. Four to eight groups of 10 people each would not be atypical. For us a small sample is 500, and we regularly have samples of 1500 and more. We use computerised software and techniques we have developed to make sense of these large amounts of unstructured responses. The method has been proven over 8 years of analysis of state and federal elections. Click here for a quote. 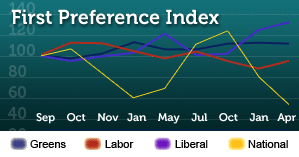 We also specialise in quantitative polling of hard to reach groups. This may be done using the Internet, or it may involve face-to-face interviews or paper-based questionnaires. While randomised selection of respondents gives the best quantitative results, some groups are so hard to find that the cost of reaching them is prohibitive. In which case other techniques need to be used. Click here for a quote. Telephone polling is the best and most cost effective form of quantitative polling. It's the method used by Newspoll and A C Neilsen, and also frequently by Roy Morgan. It's also a method we're happy to use when it suits your purpose. Click here for a quote. If your budget doesn't stretch to telephone polling you can get good results using online panels which are selected to be statistically representative of the community. This style of polling may not be quite as accurate, but as well as being cheaper it can generally be done faster. Click here for a quote. We also conduct focus groups if that's what your project needs. You can test things in focus groups that you can't test with our online surveys. In fact they often fit well-together, with the online surveys being used to select participants. Small group qual doesn't have to be done face to face either. If the people you want to talk to are geographically dispersed you might want to see how we run an online focus group. Click here for a quote.